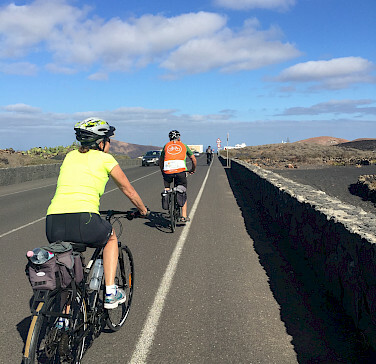 This self guided or guided bike tour in Lanzarote, the most easterly of the Canary Islands, is a unique offering in one of the most dramatic landscapes in all of Europe. 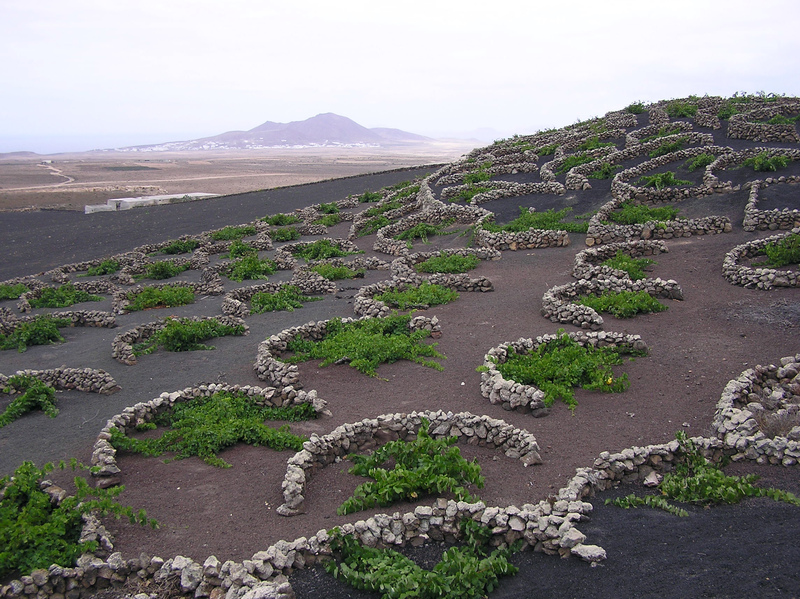 Due to the recent volcanic eruptions during the 18th and 19th Centuries, many parts of Lanzarote appear other worldy, even lunar. So unique is this dark landscape, and the rare mix of geology and ecology, the island is registered as a Unesco Biosphere Reserve. 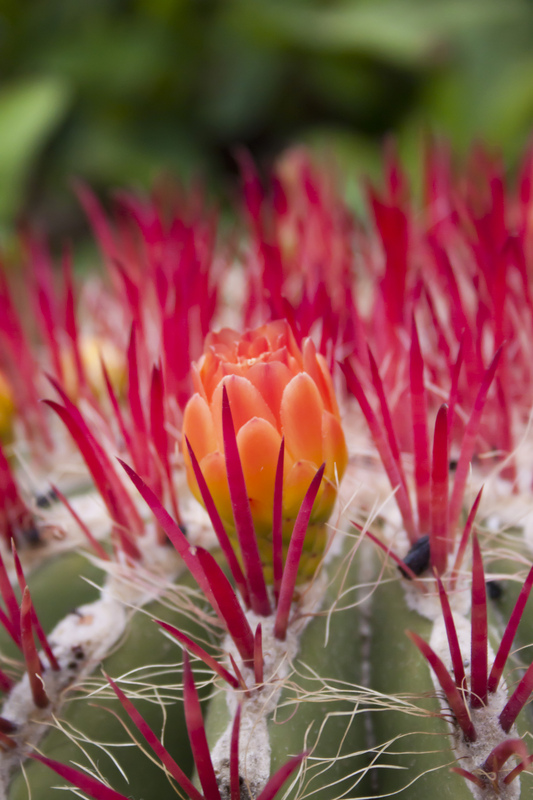 The architectural works of César Manrique, Lanzarote born and world renowned architect and artist, are an incredible complement to the volcanic environment. 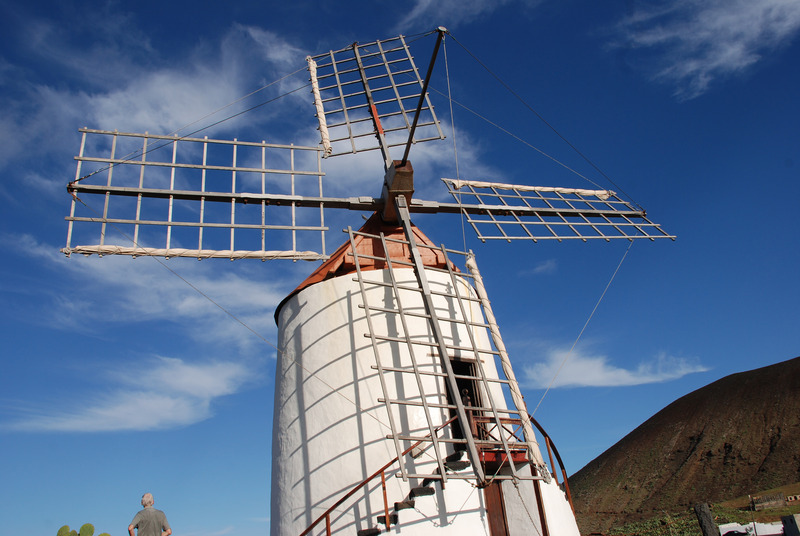 His goal was to make Lanzarote the most beautiful of all the islands, fusing the spectacular landscape with his own style of art. The benign climate, truly an eternal Spring, provides for year round cycling. 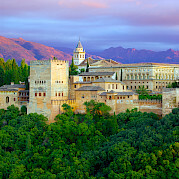 We prefer the version of this tour in which you are accommodated in the Hotel Boutique Palacio in Teguise which we saw as it was being restored and remodeled. The original building is from 1690. If there is no availability, we will offer you a slightly different version of the tour in which you will overnight in San Bartolomé. You decide! 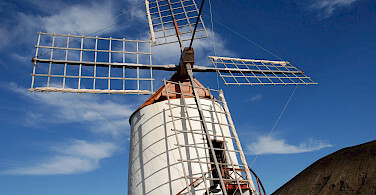 If you are looking for a different flavor, check out all of our bicycle tours in Spain. Please ask us for extra night pricing as this varies depending on season and location. Boat to Fuerteventura (optional day 6 excursion): Please ask. Fly to Arrecife Airport (ACE) in San Bartolemé, Las Palmas. 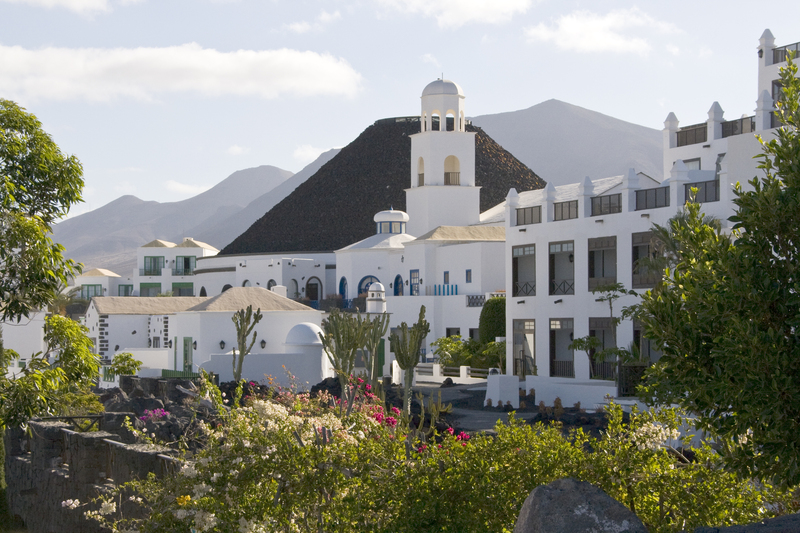 It is advised to take a taxi to your first hotel, Costa Teguise, approximately 14 km from the airport. You can also book a private transfer through SunTransfers.com. The weather in Lanzarote means that cycling is possible all year round. 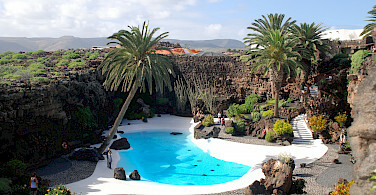 The island avoids extremes of temperature both in the winter and in the summer. Please check local conditions before your arrival. A very good website to research average high/low temperatures, average rainfall and more is weatherbase.com. You can rent a hybrid bike, road bike, or electric bike for this tour. It is possible to add extra nights before, after or during tour. Please ask us for pricing. 2019: Self guided: Arrival daily all year round. *Special tour dates can be arranged for 4 or more riders. We are rating this tour moderate, with a couple more difficult days. Terrain is mountainous on one or two days, depending on itinerary. For the remainder of the days, terrain has constant rolling hills. For self guided tours, generally speaking, two or three options are provided. Distances vary and 2 free days are included in which you can decide to cycle or not. This is NOT a tour for beginners as some climbs are difficult and winds can be a factor. However, electric bikes are available, which change the difficulty rating. For the guided tour, you will have the added benefit of support vehicle with tour leader. The guide does not ride with the group. 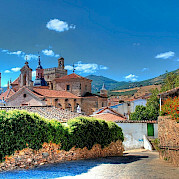 Accommodations range from a luxury 5 star spa hotel to a lovely restored Spanish finca. 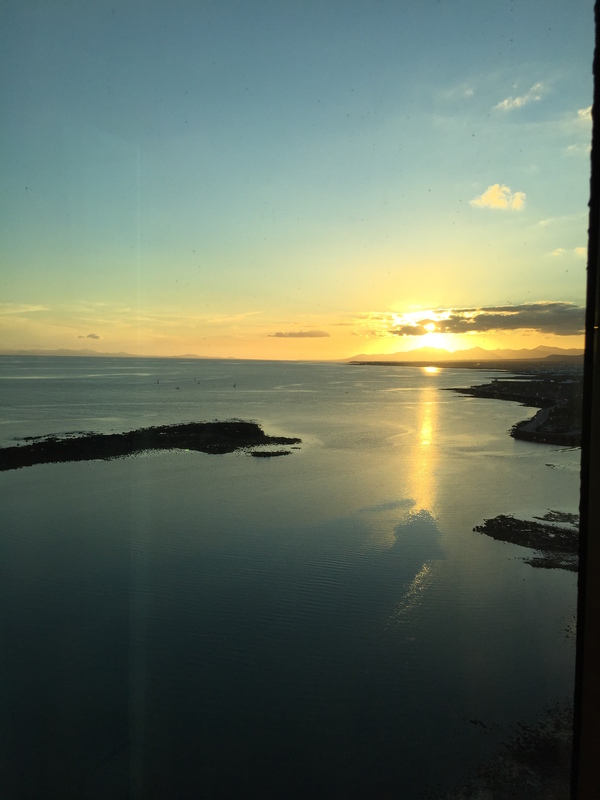 Upon arriving at Arrecife Airport in Lanzarote, it is recommended to take a taxi to your first hotel which is approximately 14 km from the airport at costa Teguise. 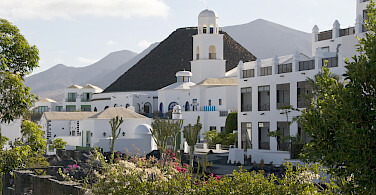 After settling in to your hotel, the rest of the day is yours to enjoy the beach resort of Costa Teguise. 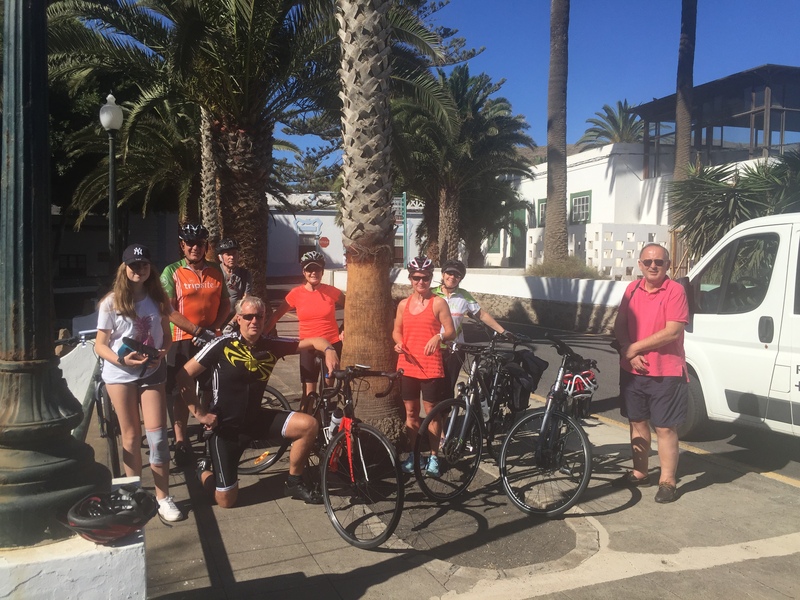 The ride today leads from Costa Teguise to the inland town of Haría. 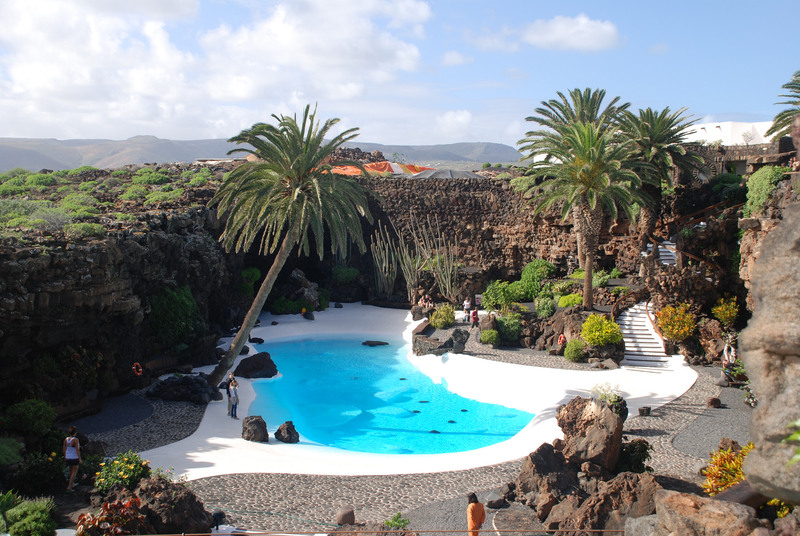 En route, you will have opportunity to visit the famous works of César Manrique, native of Lanzarote and a world renowned artist and architect. 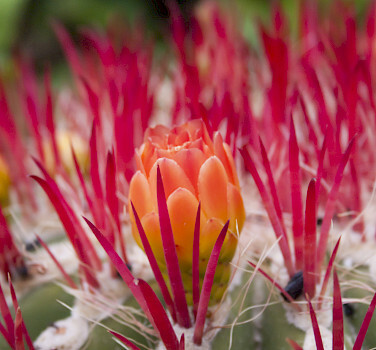 His creations, integrated in the natural landscape, are renowned for their simplicity. His works are recognized unanimously by the intellectuals as well as the esthetes. As an interior architect he has accomplished a harmony of space and volume. 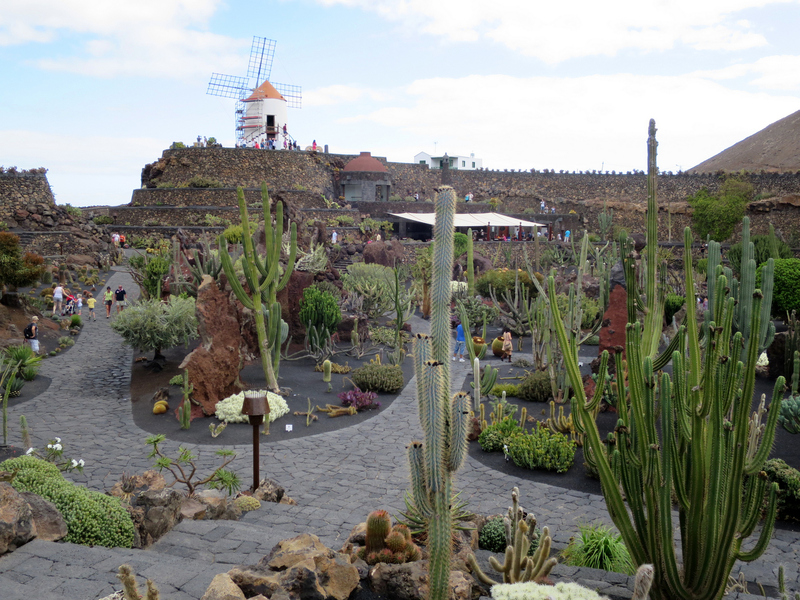 Your itinerary includes the works El Jardín de Cactus, Los Jameos del Agua, and El Mirador del Río which form an integral part of the volcanic landscape. You will also have the opportunity to visit the volcanic cave of La Cueva de los Verdes. The route leads through typical fishing villages with the impressive Monte Corona as your backdrop. The picturesque village of Haría, surrounded by its uncountable palm trees, is your day's destination. Vertical meters: 536, 721, or 847 meters. 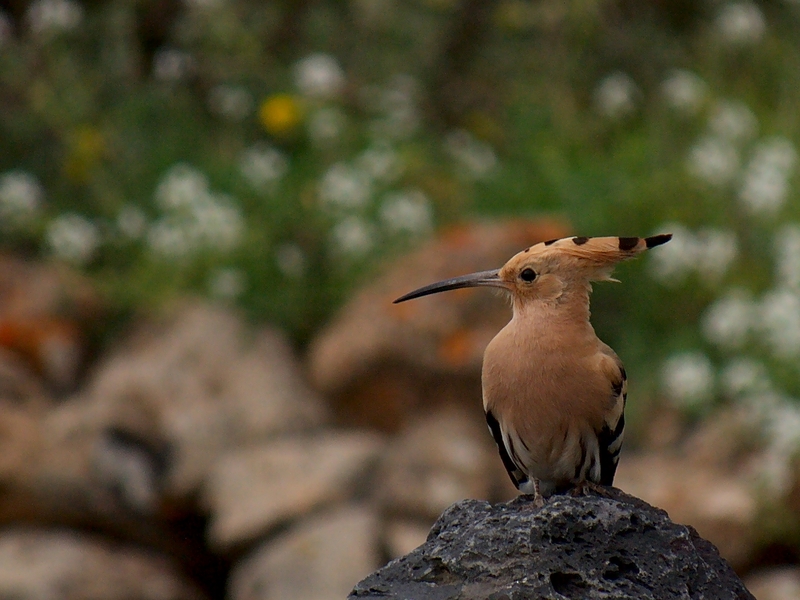 From Haría, you take the road down towards Teguise, the one-time capital of the island. Our route gives us spectacular views down over the coast. 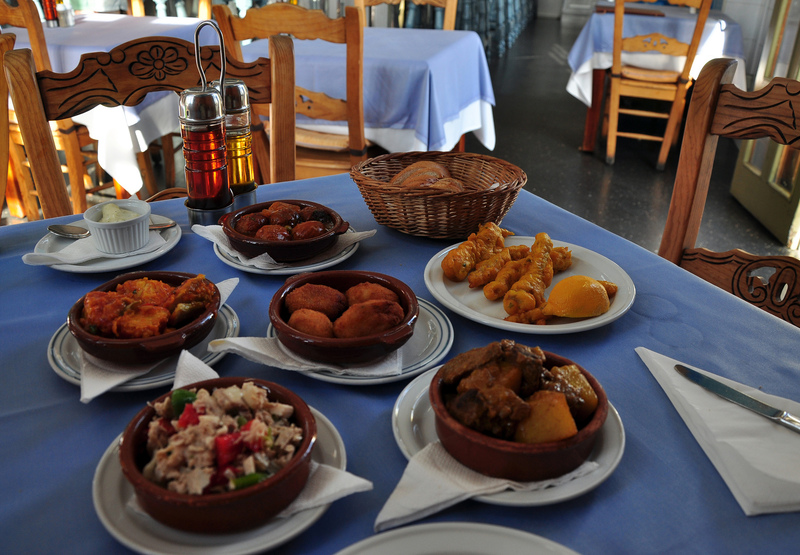 Teguise itself is a delightful small town with typical architecture and many pleasant bars for refreshment. From here we continue towards San Bartolomé and the fascinating wine-producing area of La Geria. We then return to our hotel in Teguise. Today is a free day spent in the Teguise hotel. You can choose to relax, or enjoy a loop ride, or even both. The ride leads to the beautiful beach of Famara with the spectacular backdrop of volcanic cliffs. 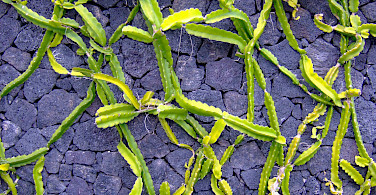 After following the coast, we head across extensive lava fields and a lunar landscape back to Teguise. First on the cycling agenda is the island’s main attraction, the Parque Nacional de Timanfaya, where Lanzarote’s volcanic nature is at its most spectacular. The eruptions of 1730 – 1736 buried around a quarter of the whole island, including several villages, and gave rise to the impressive lava and volcano landscape of today. 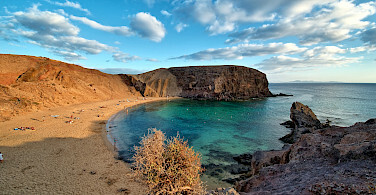 Next, heading south, you will stop en route to visit the seaside volcanic crater of El Golfo before finally reaching the seaside village of Playa Blanca. Vertical meters: 336 or 423 meters. 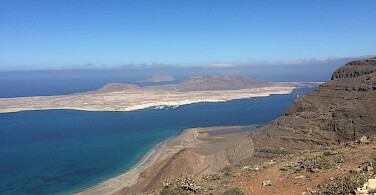 Playa Blanca sits at the very south of the island and looks across to Fuerteventura. Today there is opportunity to take a boat across to Corralejo and enjoy a visit or a ride on another island. 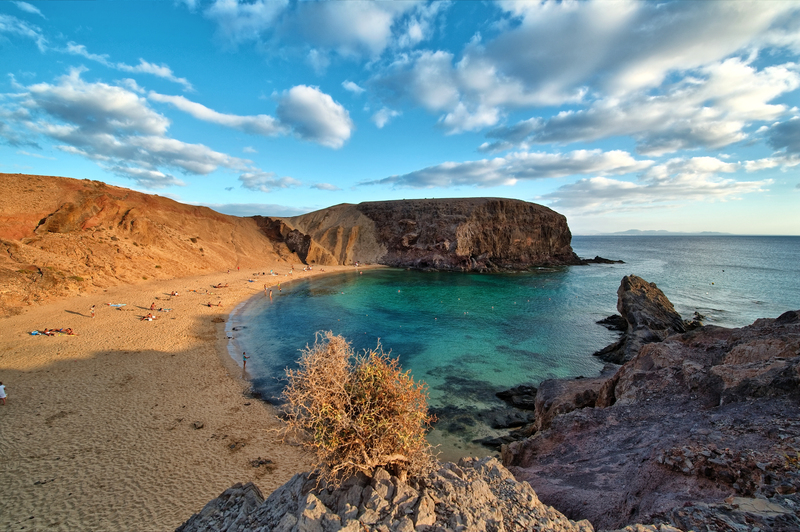 Alternatively, you can enjoy the day in Playa Blanca, visit the nearby coves and secluded beaches of Papagayo, or visit El Golfo for a seafood lunch by the beach. Vertical meters: 312 or 618 meters. From Playa Blanca, you pedal across the dramatic hills of Femés before heading to the wine country of La Geria. Here, the unusual vineyard cultivation techniques have given rise to a fascinating landscape not to be seen anywhere else in the world, not to mention, also producing some fine wines! 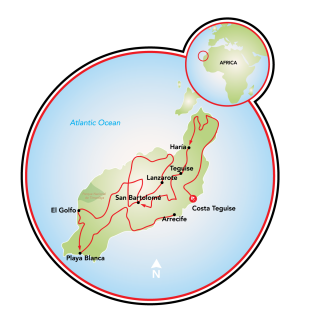 The route then descends to the coast and follows a nice promenade from Puerto del Carmen to Arrecife. Vertical meters: 718 meters. 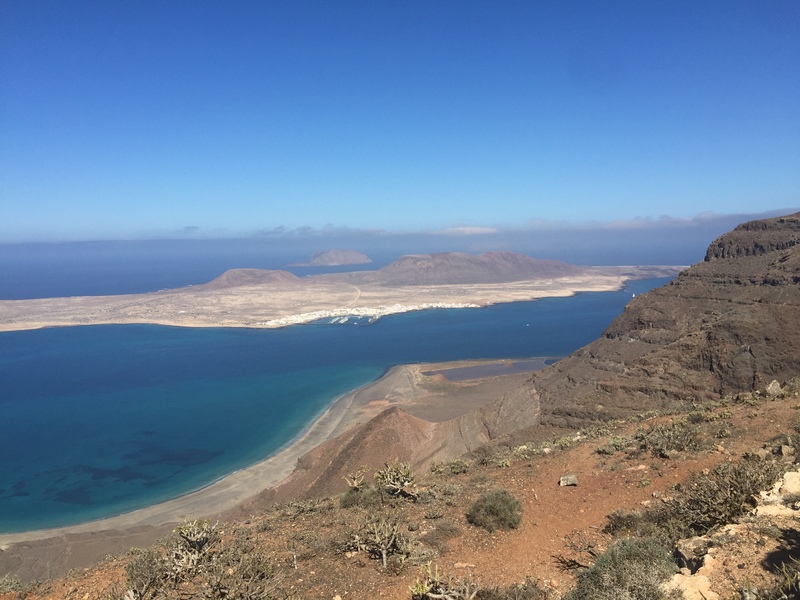 From Haría, you cycle to Teguise, the one-time capital of the island, through spectacular scenery along the coast. 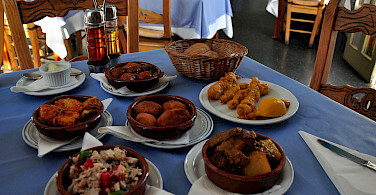 Teguise itself is a delightful small town with typical architecture and many pleasant bars for refreshment. 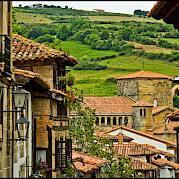 The route then continues to San Bartolomé and the fascinating wine-producing area of La Geria to the country hotel where you will spend the next two nights. Vertical meters: 504 or 703 meters. Today is a free day. You choose to take a break from the bike, or to enjoy a round trip ride around the town, or both! The cycling includes the beach of Famara with the spectacular backdrop of volcanic cliffs, in the Natural Park of the Chinijo Archipelago. This beach is well know by surfers from all over the globe who come to tackle this "European Hawaii". 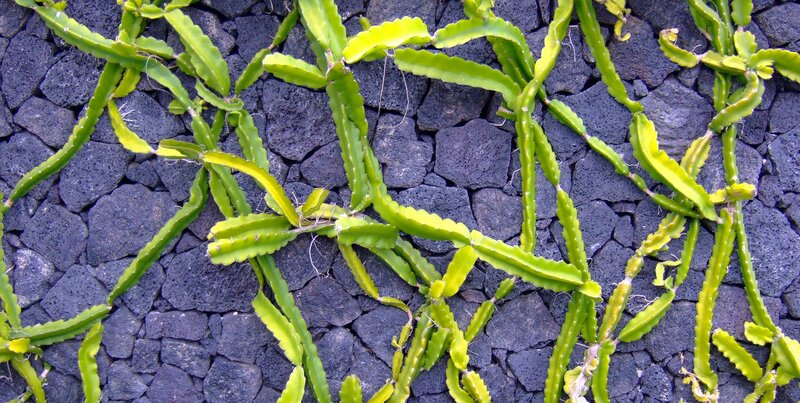 After following the coast, you will pedal across extensive lava fields and a lunar landscape back to San Bartolomé. 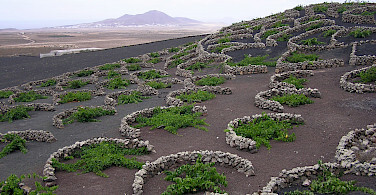 A shorter route is possible to Fundación César Manrique or Teguise. Vertical meters: 485 meters. 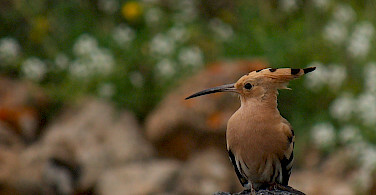 Yet another option: If Villa Lola and Juan is fully booked in Haria, you will be offered to two nights in Costa Teguise. GPS tracks are available for this tour. *Extra nights can be added at any time within the tour (self-guided). View all our featured bicycle tours, specials, and news or look at our full list of bike tours in Europe! Highlights: Learning about how the farmers deal with the sparse rail fall and seeing the lava gravel covering the fields to assist in collecting the condensation. Seeing the unique way that they cultivate grape wines for the wine in individual walled semi-circles was amazing. I would rate this ride as a moderate to difficult, taking into account the elevation of the mountains. 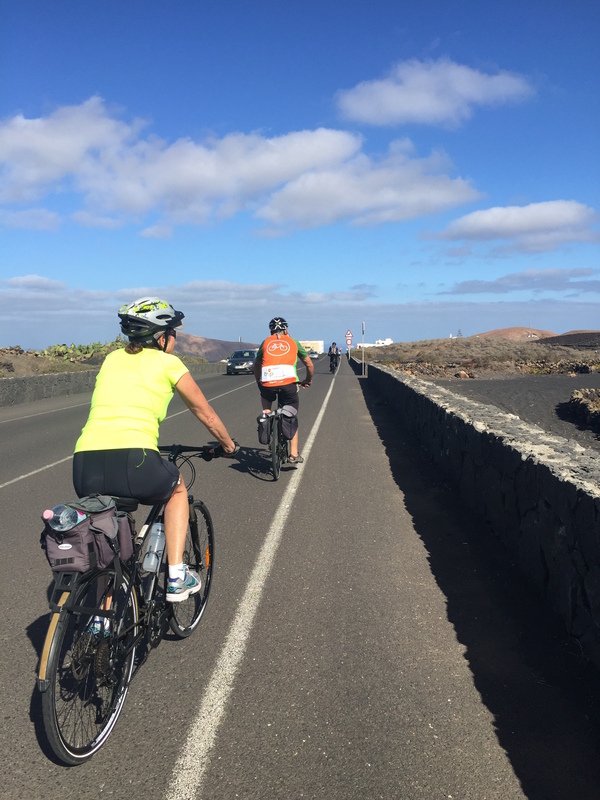 Lanzarote is a beautiful destination perfect for a week of cycling! The volcanic landscape, mountains, caves, architecture, ocean views, climbs and downhills are all amazing. 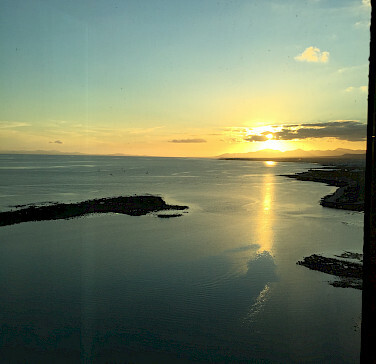 Unfortunately, our experience with our fist hotel and Papagayo Bike could not be described as beautiful or amazing. 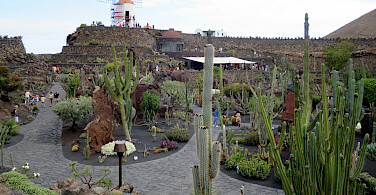 Our first two nights in Costa Teguise were spent at a hotel geared toward toddlers (H10 Lanzarote Garden Hotel). The room and breakfast options were quite good but the hotel was exceptionally overrun with toddler, strollers, and toddler oriented entertainment. 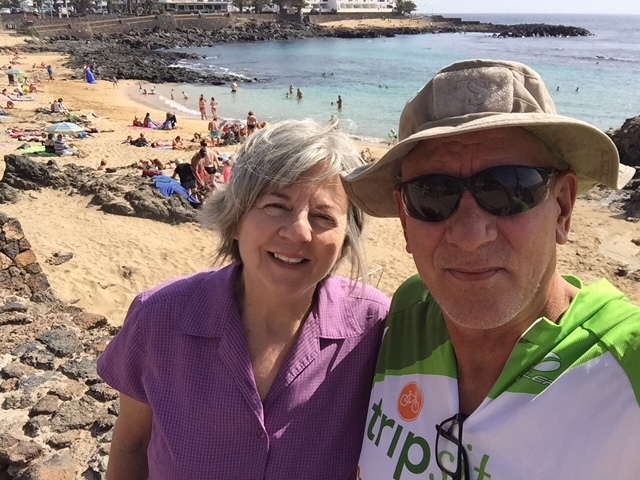 This "toddler hotel" became even more disappointing when we found Papagayo bike shop located at, and nearly inside, a much more adult oriented hotel on the water. Again, unfortunately Papagayo Bikes did not meet our expectations. As a nearly two meter tall person I had specifically asked about bike fit and been told they could fit me just fine. The employees at Papagayo knew little about bike fit and how to move seats and bars. Read more… I had not brought my own tools because I had been told I'd be provided a small tool kit. I had to beg to take a hex key from the shop so I could make small adjustments along the way on my too small bike. The hybrid bikes provided were rather worn out and not at all up to the standard of the road bikes being rented out at this shop. We had to decline the first bike provided to my wife due to poor shifting and noisy brakes. The second bike seemed okay and she rode that for the first day of the tour, only to have difficulties with the brakes throughout that day. Although the route description we signed up for said we would be staying in Haria at the north end of the island our second night, we were not booked into accommodation in Haria and instead had an 80 km first day to get back to Costa Teguise for another night at the toddler hotel. 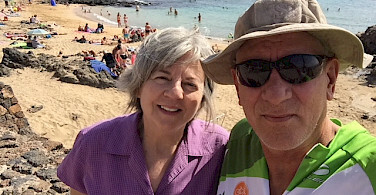 Since we were nearby the bike shop, the next morning we brought my wife's bike back to Papagayo. They said the brakes could not be fixed right then and received what was now her third bike. She rode that one, dusty from being in storage, for the rest of the tour. When she got a flat on a long climb we discovered her spare tube was for a mountain sized tire! Luckily, the tube in my own pannier was the correct size and we were not stranded. New, correct sized tubes were immediately dropped at our second hotel the Florida. Our experience at the Florida was lovely in every way. The room, the food, the entire experience was just lovely. 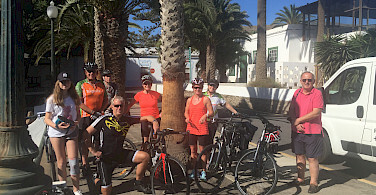 Our experience, and disappointment at the start of the tour, were smoothed over and tempered by the amazing island of Lanzarote and the much more adequate accommodations after those first two nights. We had a lovely experience despite the less than stellar first hotel and issues with the bicycles.